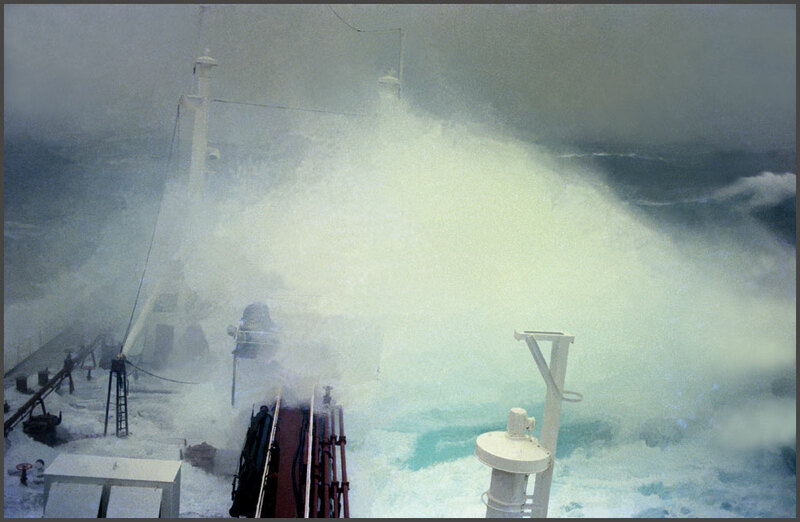 All sailors have experienced storms at sea, which are quite different from the land based versions, mainly because another element is heavily involved, - water! 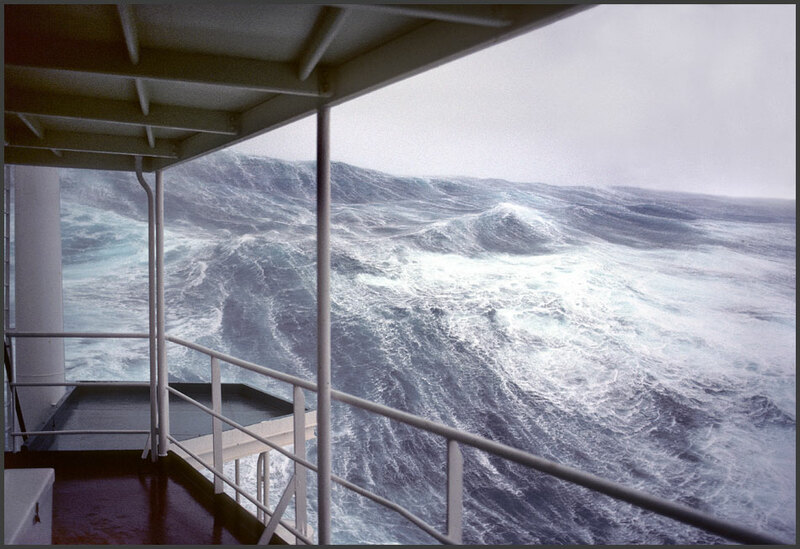 And on the open ocean, there is nothing to stop or deflect the howling wind. Also it makes a big difference, that your base is not solid ground,- but a moving platform,- a ship! 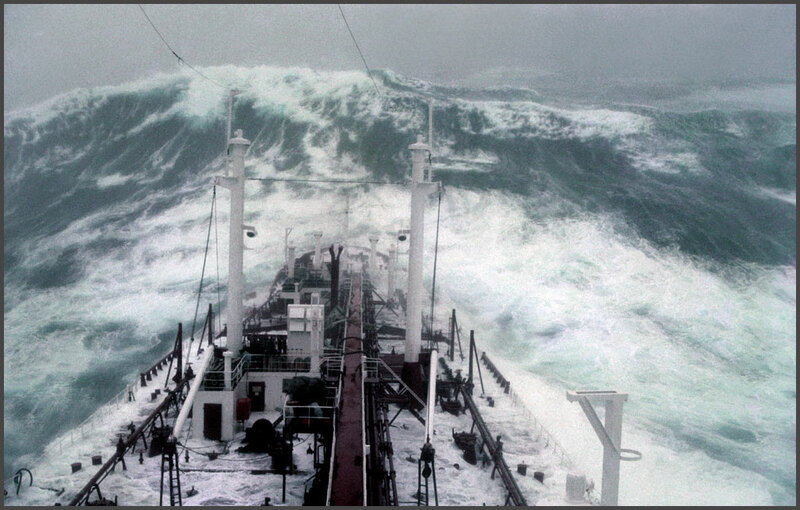 On the great oceans of the world, the height of the storm waves usually does not exceed 8 to 10 meters, which actually is quite impressive. 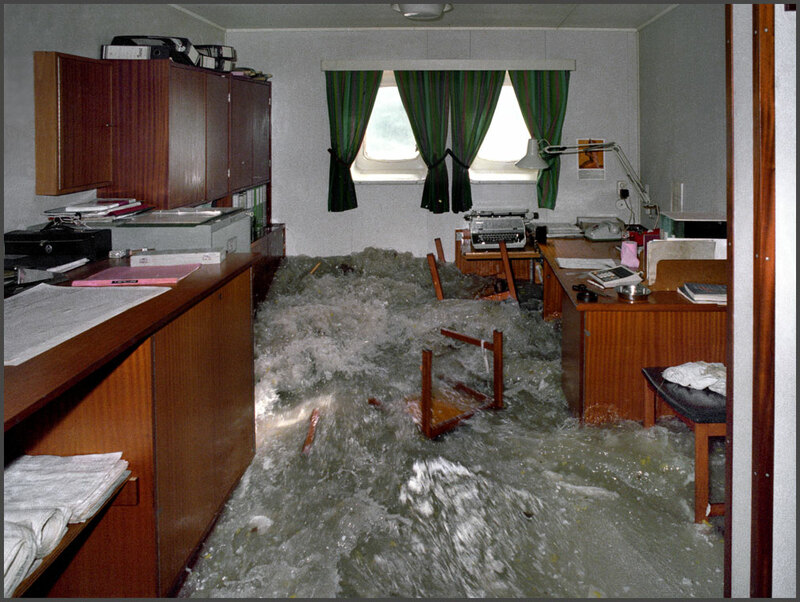 Image a "wall" of water at the same height as a two story house coming crashing towards you with an incredible speed! it can be quite awesome to experience! 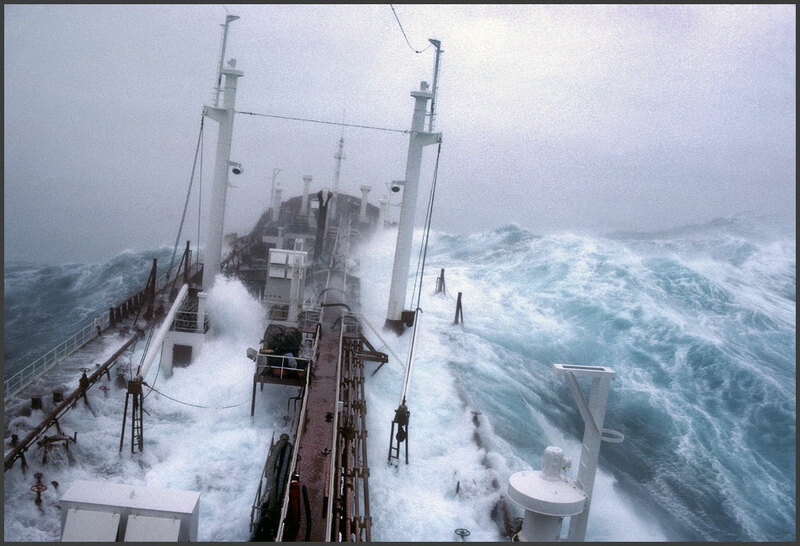 But what happens if the waves are NOT just 10 meters tall, but more likely 20 meters??? Or more??? 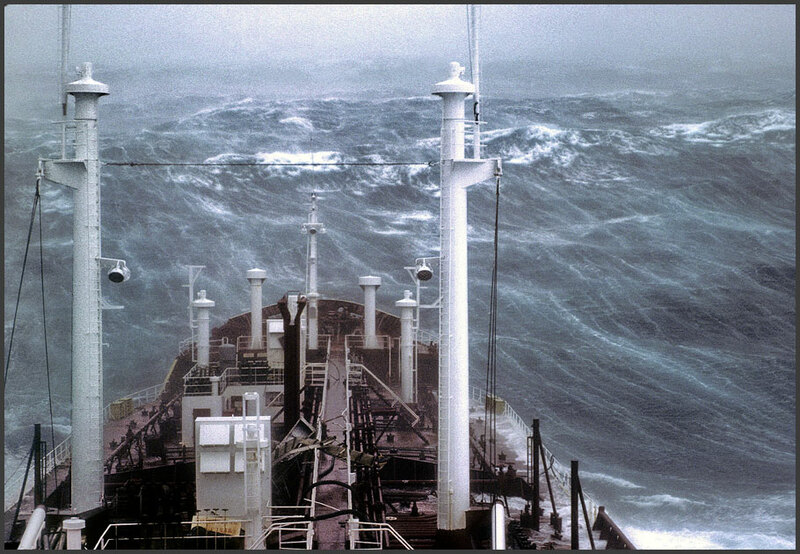 It is VERY seldom that huge waves over 20 meters are developed, - and normally sailors do not even see them, because ships nowadays will try to avoid such conditions by altering course in good time before the storm hits. 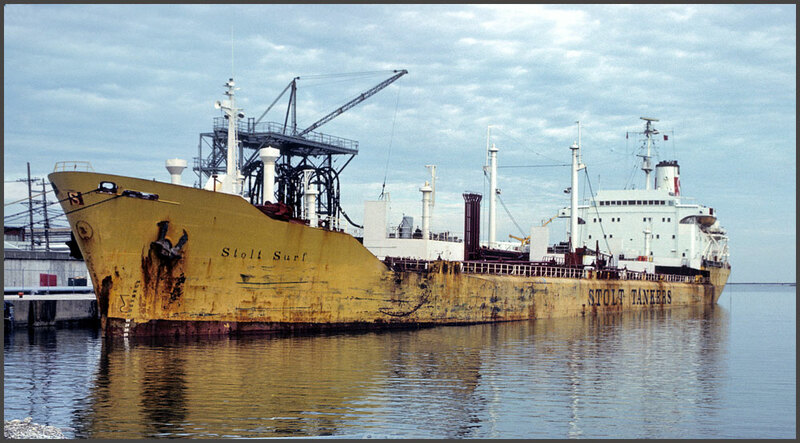 But not so with the good ship "Stolt Surf", - which on a voyage across the Pacific from Singapore to Portland -, headed straight into a very strong hurricane, - went through its center -, and was hit again on the other side of the "eye"! 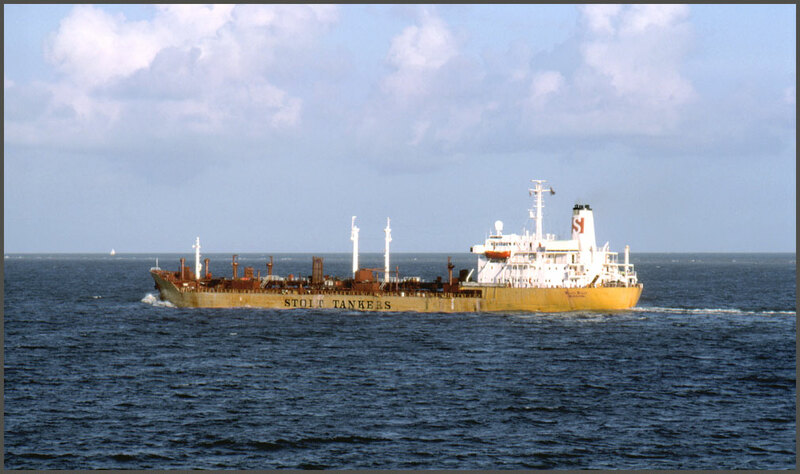 "Stolt Surf" was a chemical tanker, and on October 4th. 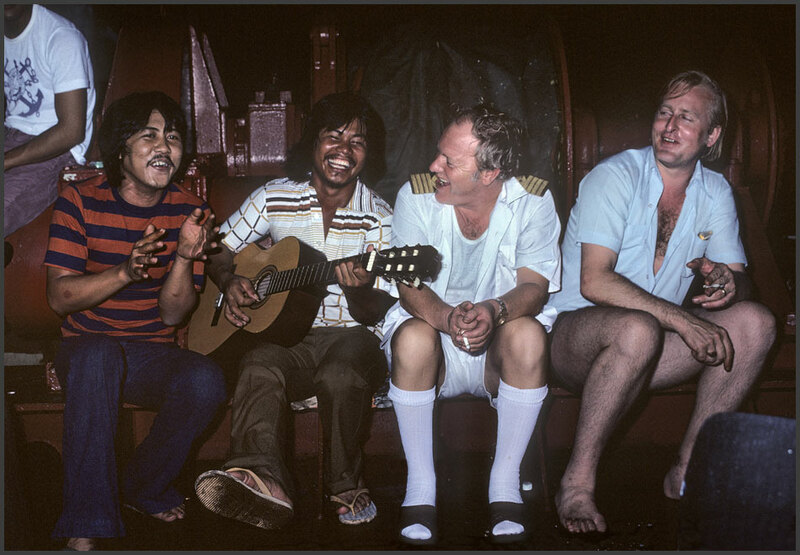 1977, she left Singapore on a routine voyage across the Pacific ocean to Portland, USA. Already in those days it was normal to obtain advice from a weather routing agency before such a voyage was commenced, and in this case the advice was to keep far to the north, in order to avoid the possibility of hitting a developing storm further south. I clearly remember Captain Oddenes saying that going north at this time of the year is quite contrary to what his sailor experience would have recommended. 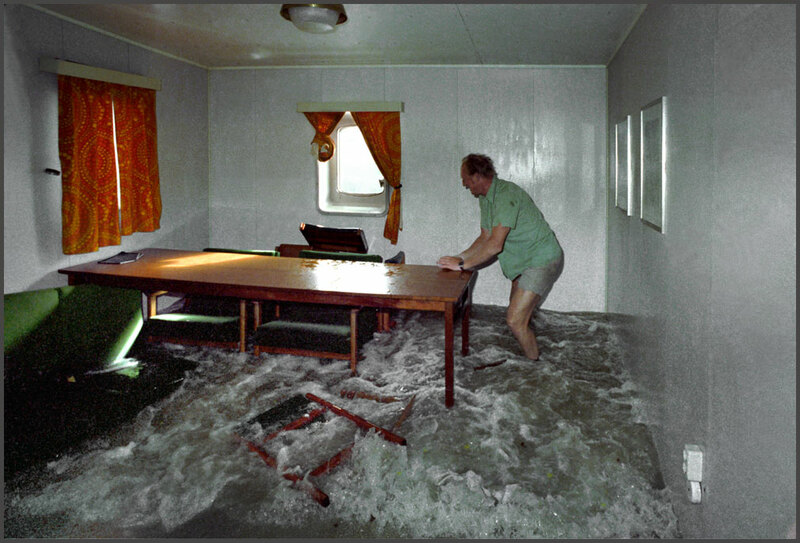 But since the routing agency had all sorts of satellites and computers to help them to predict the weather, - Captain Oddenes decided to take their advice and go north, instead of following his own instincts and years of experience! On October 18th. 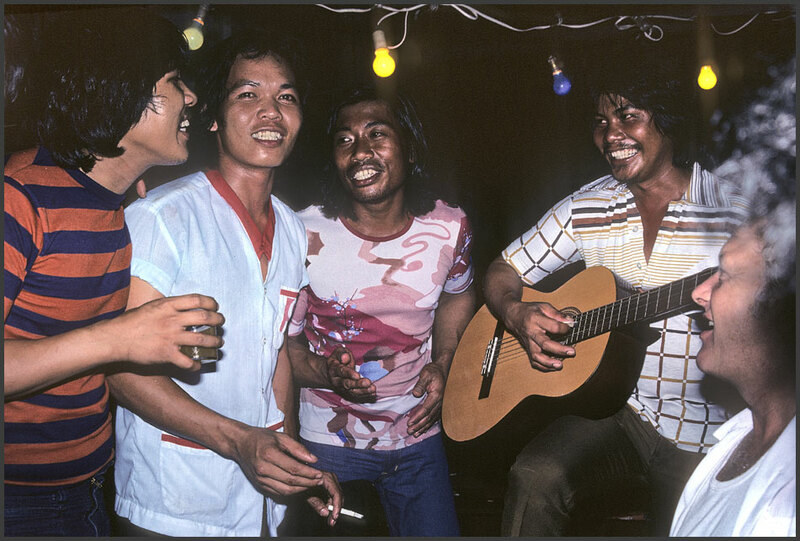 1977, the barometer started to drop and the weather worsened. 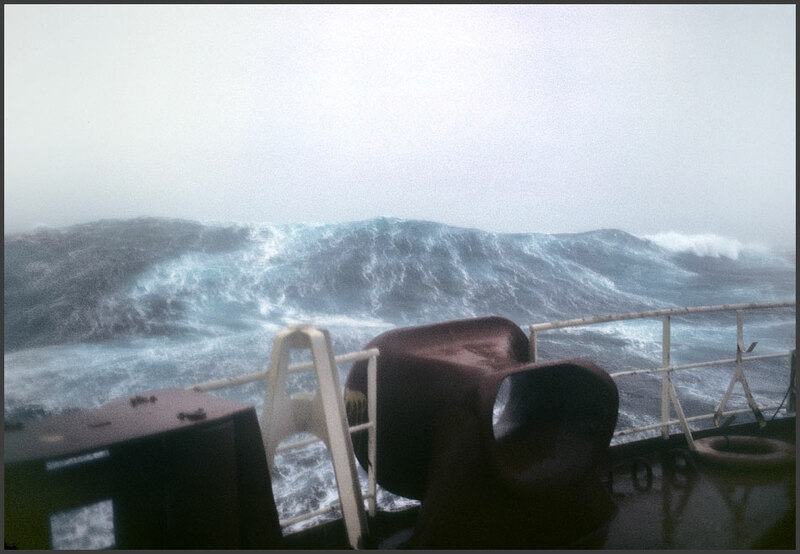 This continued through Oct. 19, and by late that night the wind had increased to a force 9/10, - the sea was becoming rough, and the sea/air temperature had fallen to 8°C and 10°C, respectively. 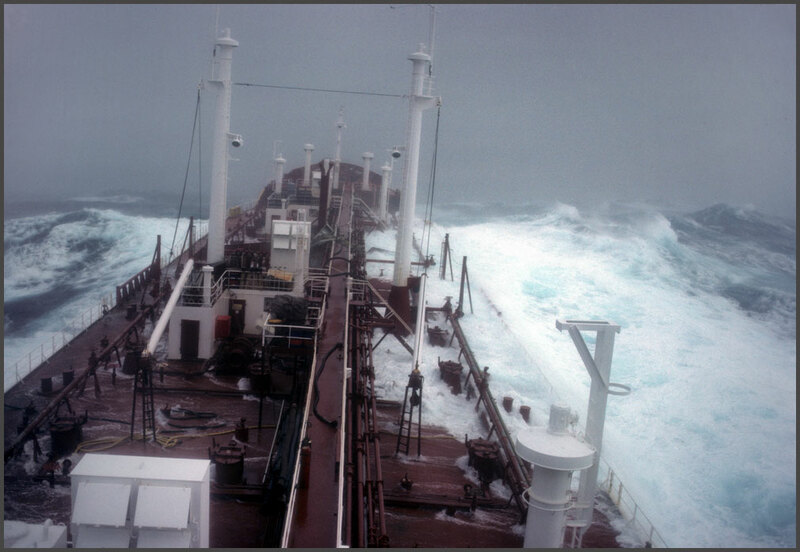 The ships steering speed was at that time down to about 5 knots, and in the early hours of Oct. 20, - as the condition really started to worsen -, the auto pilot was switched off, and manual steering was introduced. 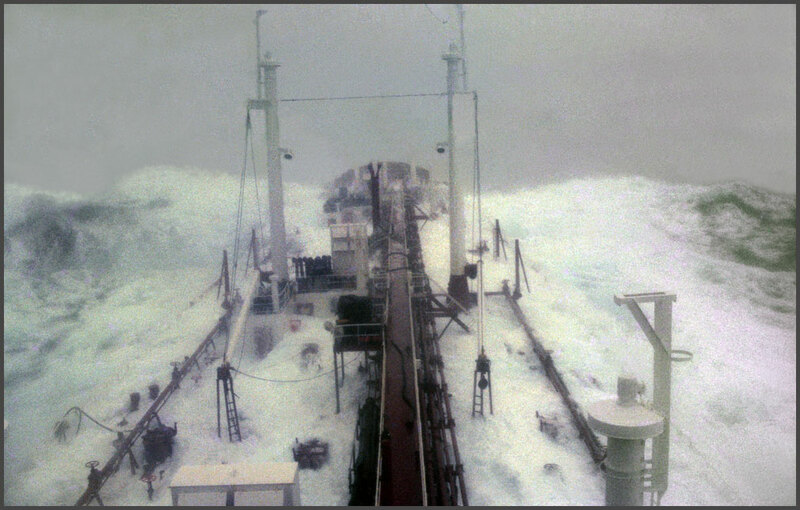 One life raft on forecastle taken overboard by heavy seas. 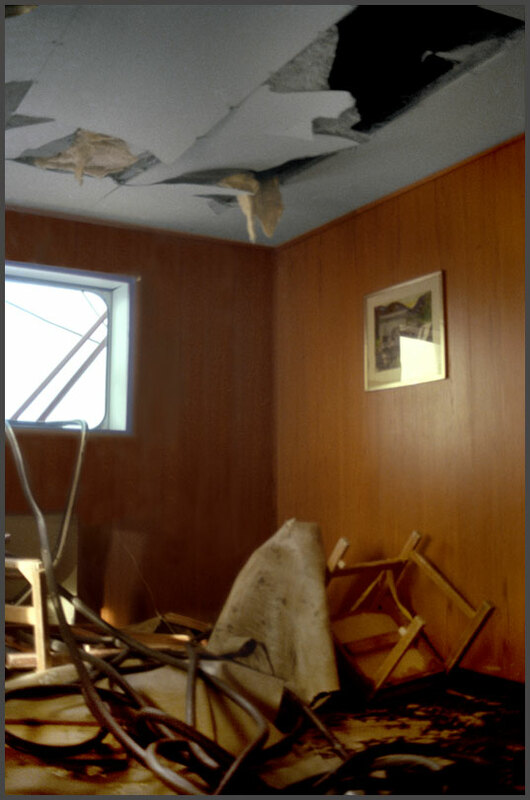 Heavy sea broke windows of the officers mess and bar, damaging furniture. Galley and electrical system were shut down due to short circuit. 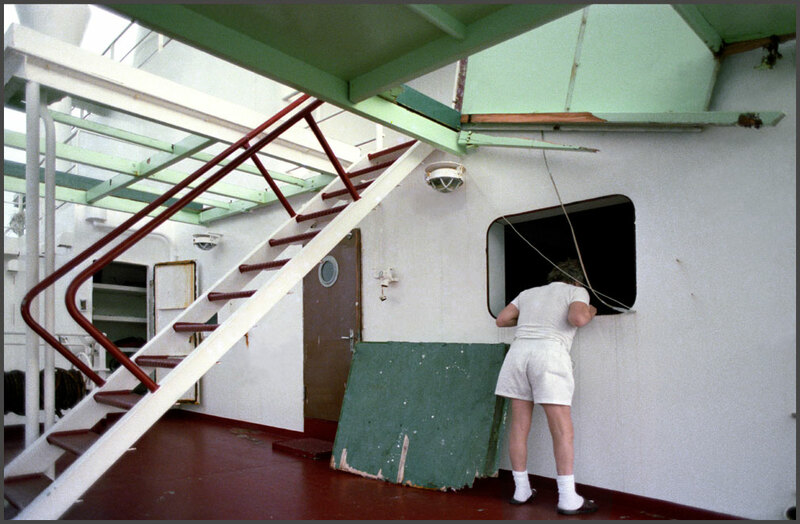 Crew's accomodation heavily damaged due to emergency doors broken. 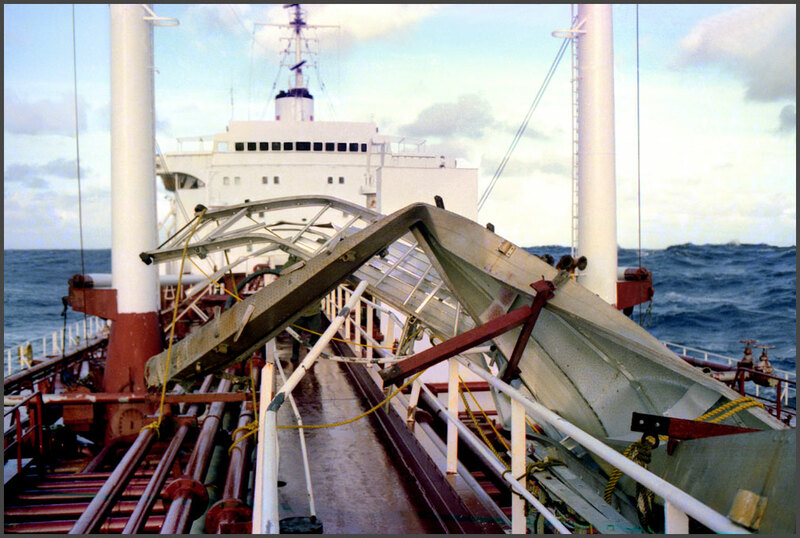 Two gangways broken, completely damaged. 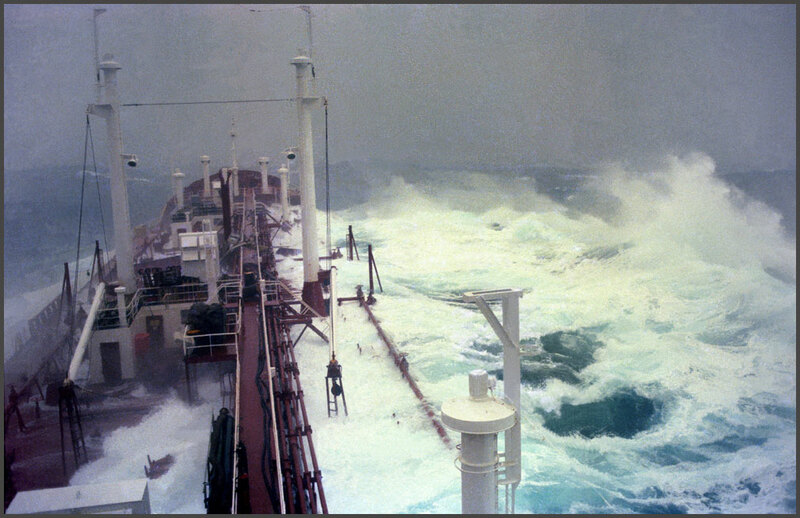 Two steel doors on the forecastle broke down and washed overboard. 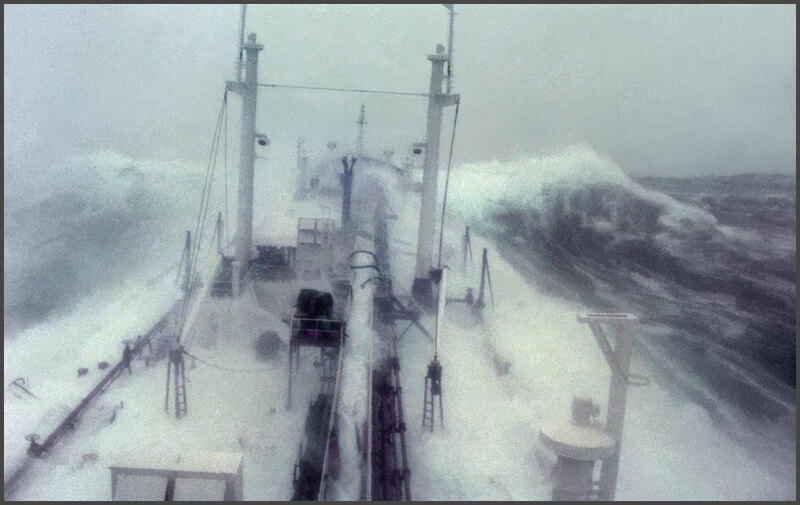 We had simply ended up right in the middle of the strongest storm I have ever experienced in my almost 40 years at sea! Also Captain Oddenes had never seen anything like it! However,- when the wind calms down, it is possible to take some fantastic wave pictures, because the waves usually first calm down long time after the wind has died. The following pictures here are mostly taken from the bridge through a rotating window, that throws off the water, so that the visibility appears quite good! 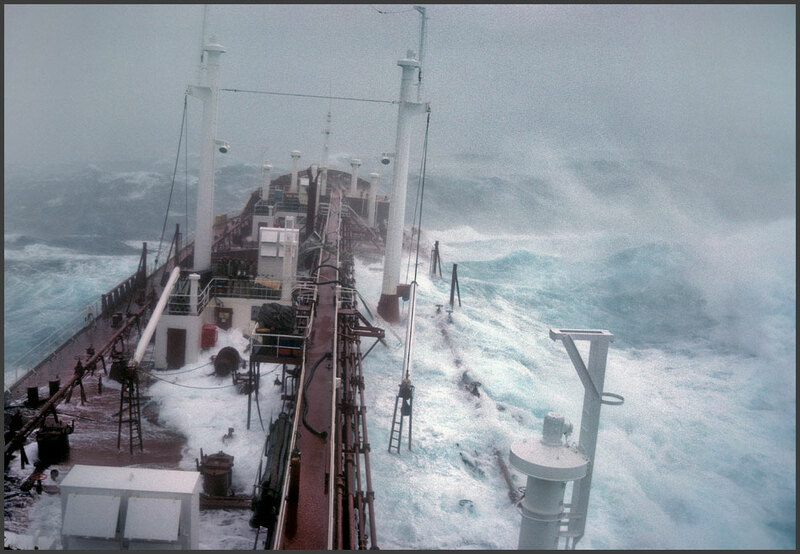 During the storm, it soon became clear, that this one was NOT one of the usual storms with "only" 10 meter waves! 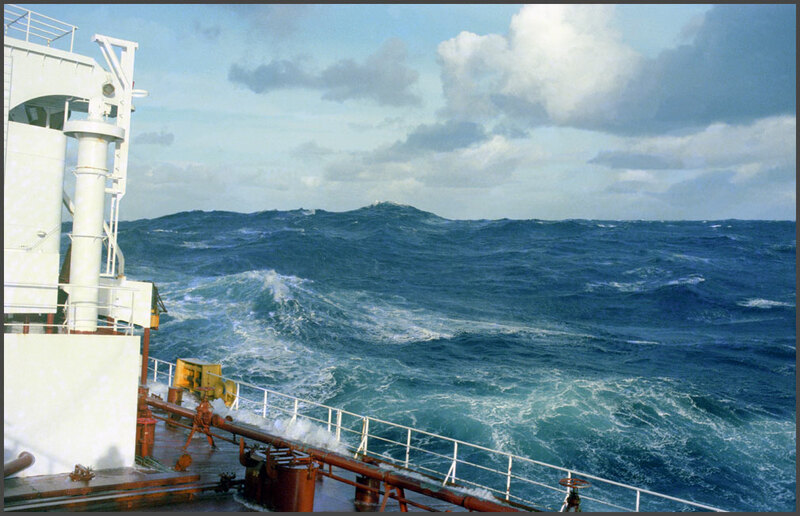 No,- on the "Stolt Surf" we experienced to our astonishment, that when the big waves came crashing towards us, we had to look UP in order to see the top of the waves! And that was from the bridge deck, which is already 22 meters above sea level! 22 meters!!! And still you had to look UP!!! 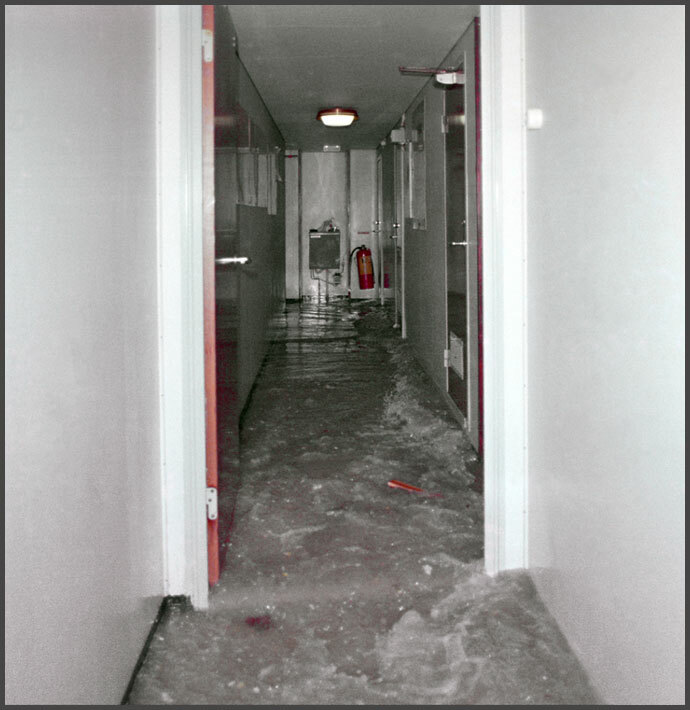 Several times we also experienced huge waves coming crashing OVER the bridge,- more than 22 meters up -, and in some very, very long seconds we only saw sea water through the bridge windows, while tons of water ran off the bridge roof,- the so-called "monkey island"! 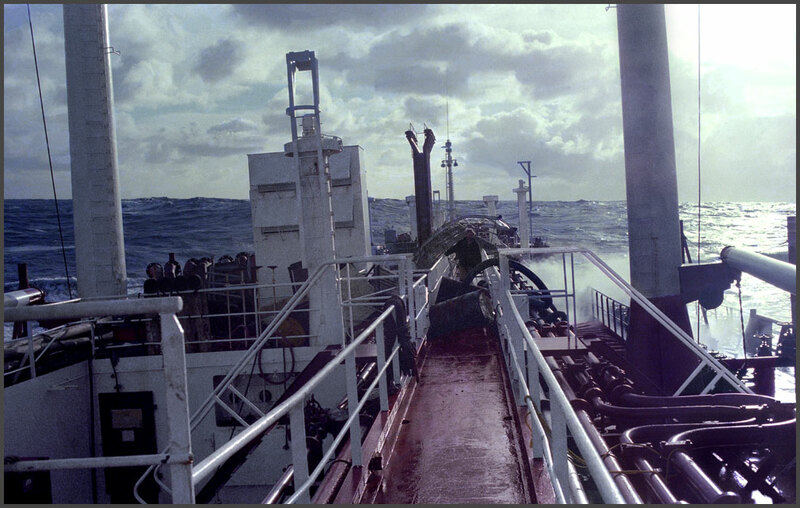 In those terrible moments we did not know if the ship was below the water or still floating! 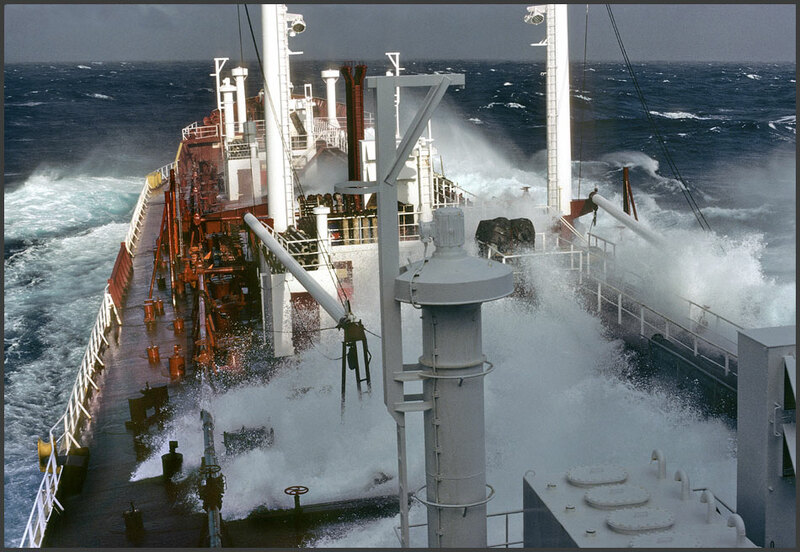 But like a miracle the windows cleared again, - and "Stolt Surf" continued its brave battle against the waves. 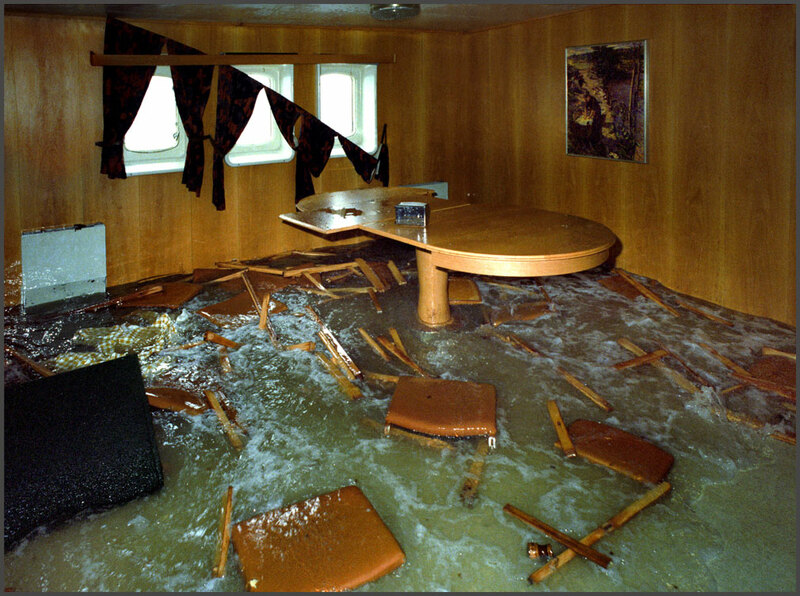 Of course the ship suffered quite a lot of damage that showed the incredible force of the water. 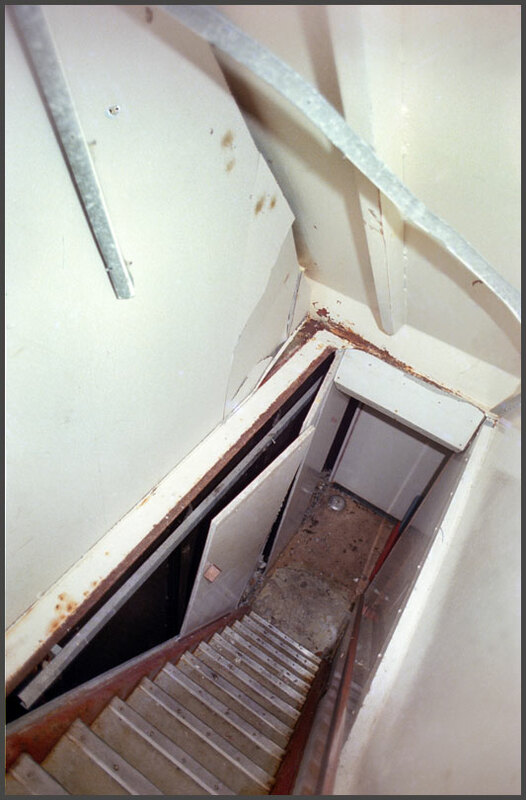 Three of the solid tank hatches on deck were simply torn off, and so was the door to the pump room, in spite of the fact that such a door is made of steel, and secured with 6 strong dogs! Straight pipelines on deck were now S-shaped, - and likewise the gangways, which was found as a mess of folded and twisted metal. Steam pipes were torn off and electric cables found ripped apart. 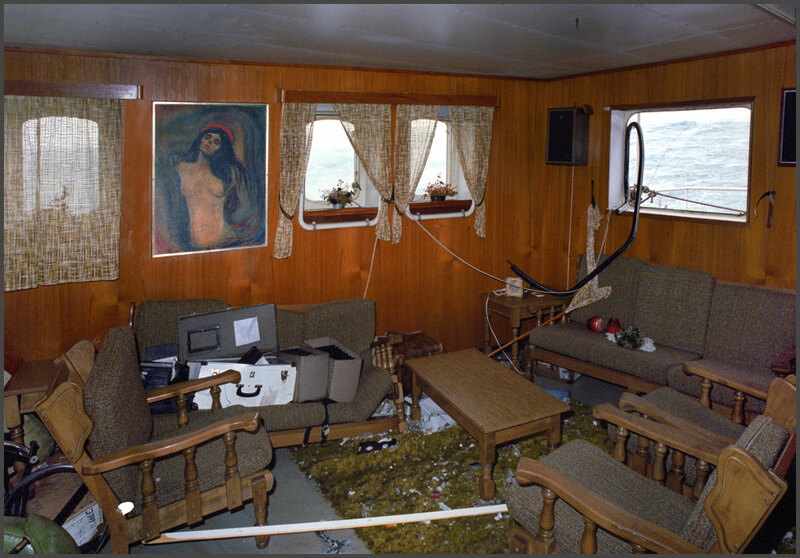 Inside the ship, all decks except the deck just below the bridge were filled with water through smashed windows and doors, and the crashing waves smashed furniture and wall paneling to pulp, so that only naked steel bulkheads were left at the crew's quarters down below! After the storm the electricity supply to many parts of the accommodation was knocked out as well, so the cook had to prepare food for 35 men on a single portable cooking plate, but never had a meal tasted better on any ship! 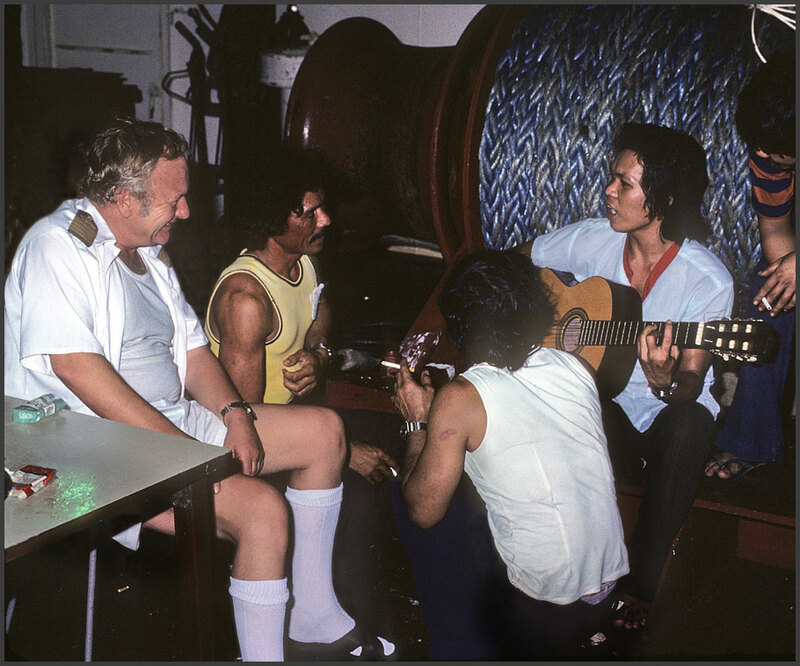 Surprisingly enough nobody were seriously injured, so we were indeed very, very lucky with only 4 sailors injured, of which only one had to stay in hospital for some time, but a couple of weeks later he was able to join his ship again. 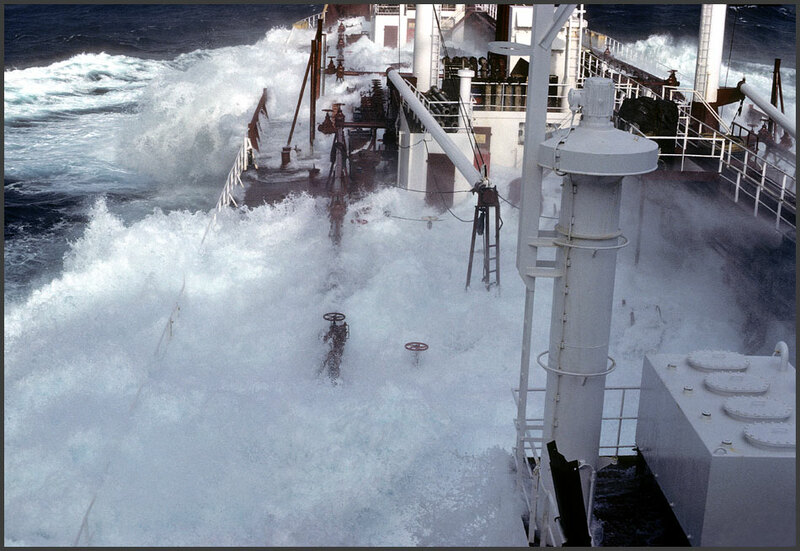 However,- if we did not manage to keep the diesels running, so that we could control the ship, we would for sure have ended up sideways in the waves. If that happened, the ship would possibly have turned upside down. In that case it is frightening to think about what could have happened, but I have good reasons to believe, that none of us might have survived, if we lost the engines!! However,- the faithful and highly reliable B&W engine never let us down, and just kept running and running and running - - - -! About one week later, - October 26th. -, the ship arrived in port, - crippled but safe -, and it is quite "fun" to think about the BIG problems the shore people now faced, when they wanted to get onboard! 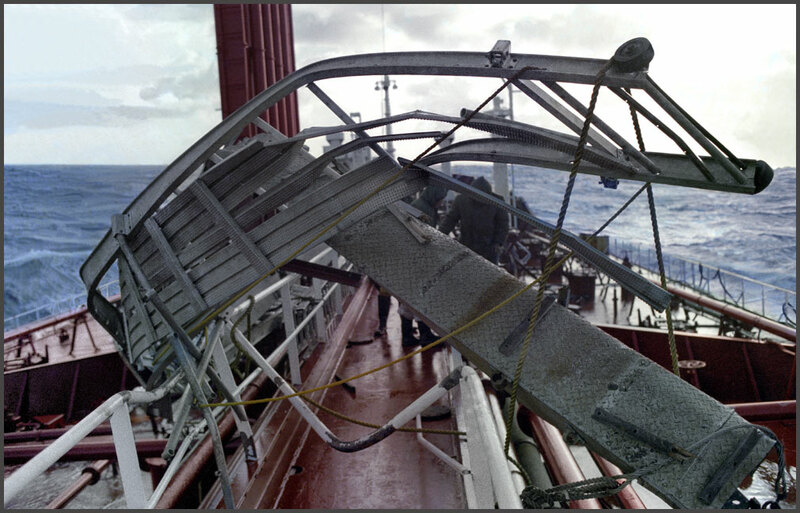 All our gangways were totally smashed or lost in the storm, and apparently it was now considered to be the biggest problem in the world, that company people and U.S. Coast Guard representatives could not easily get onboard due to the missing gangways! 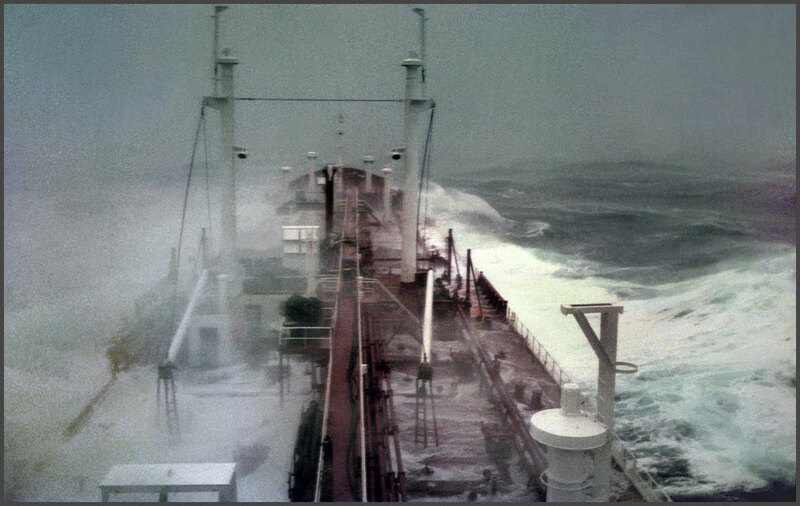 They simply did not understand, that the damaged gangways in fact was a VERY minor "problem" compared to the real problems the ship and its crew had experienced during and after this unusual strong storm! The ship was heavily damaged, and could very easily have sunk, -, but to the shore people it was much more a concern, that the red carpet were NOT immediately laid out for them. Well,- if any of those people see the following pictures, then maybe they will understand, that there really was far more important things in the world than the lack of a readily available gangway! But for now,- please have a look at the following pages, and try to "feel" the tremendous power such extreme storm waves have. However, - photographs will never be able to create the true feeling of actually being there,- right in the middle of an unusual strong storm. 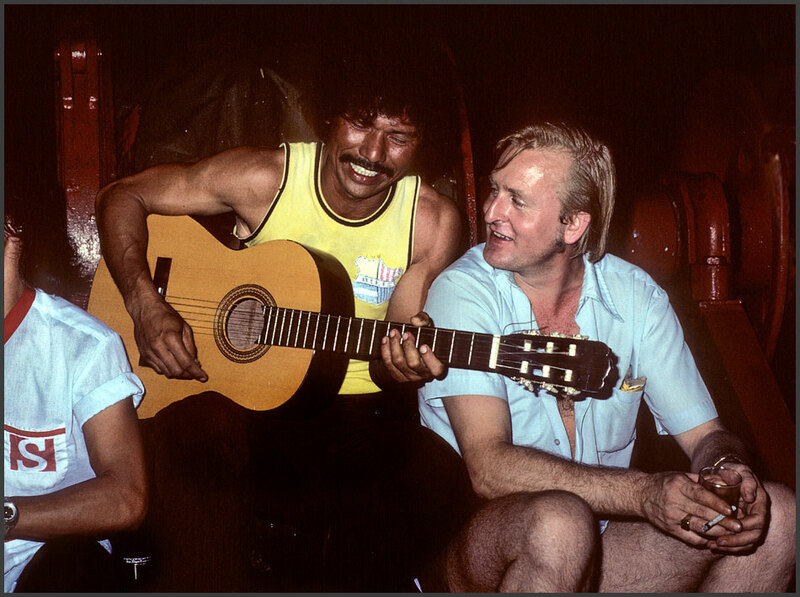 What is missing is the extreme sounds of the ship, - the howling wind and crashing waves, - the violent movements, - the fatigue, - and not at least the feeling of being very, very small and insignificant in this truly great, and awesome performance of "Mother Nature"! 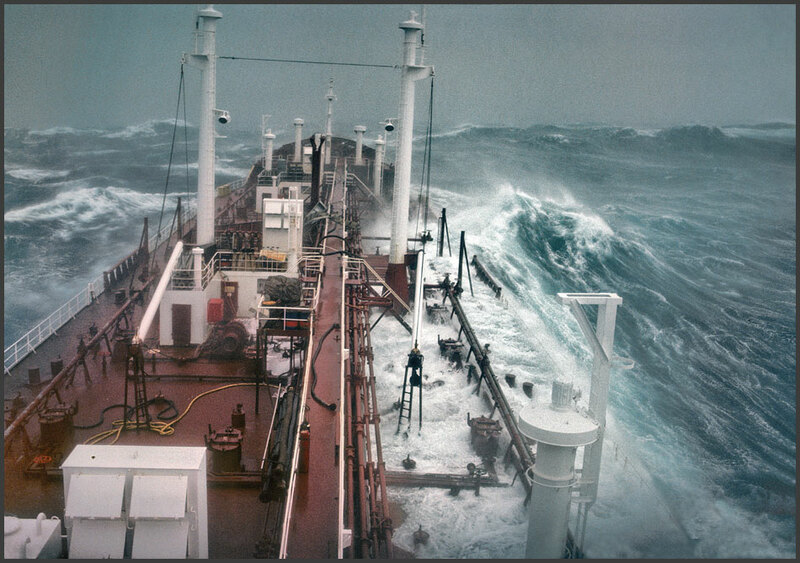 - it's getting worse, - waves getting bigger -, but still absolutely nothing to worry about, - NOT YET! 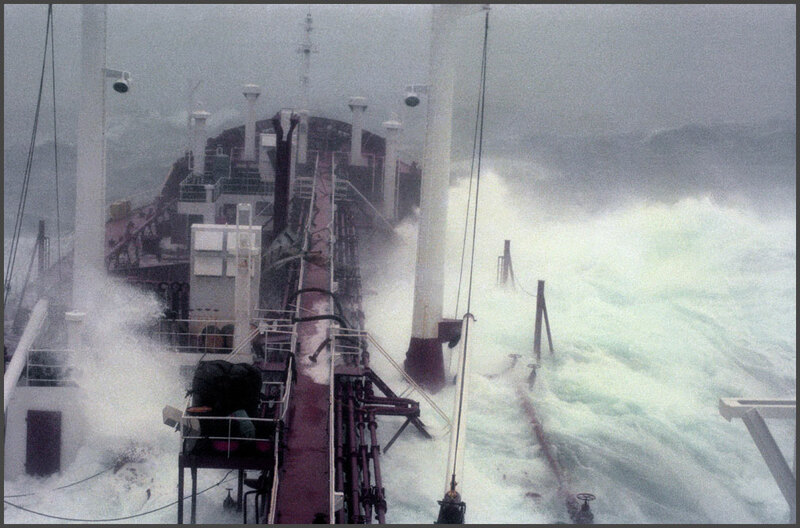 Eventually "Stolt Surf" managed to survive the first part of the storm. Very sudden the wind died, - and it became unusual quiet compared to the deafening roar of wind and waves we experienced during the period before . . . But it was a false sense of security. 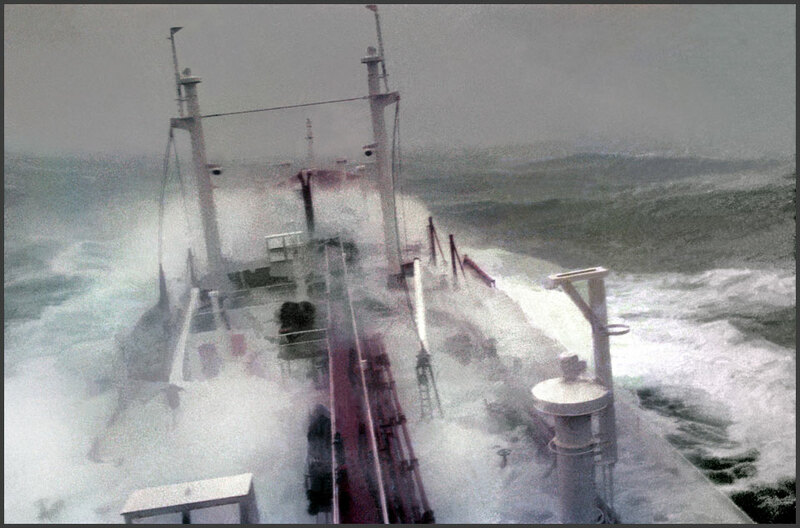 "Stolt Surf" had just entered the "eye" of the hurricane, giving us a short time of relative peace, - then the hurricane came back again, - and once again we entered the "Gates of Hell" as if the ocean would not let go its grip of us! 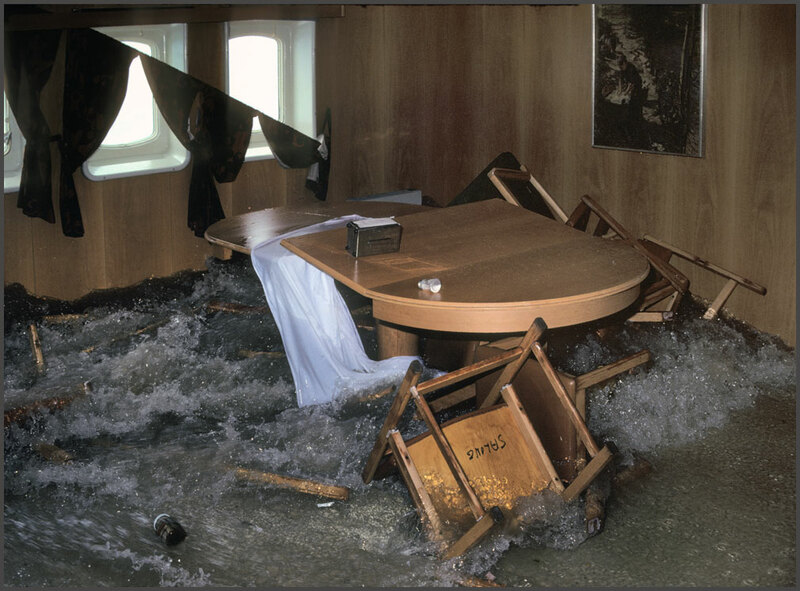 The bar suffered relatively little damage because it is placed on the second highest deck. 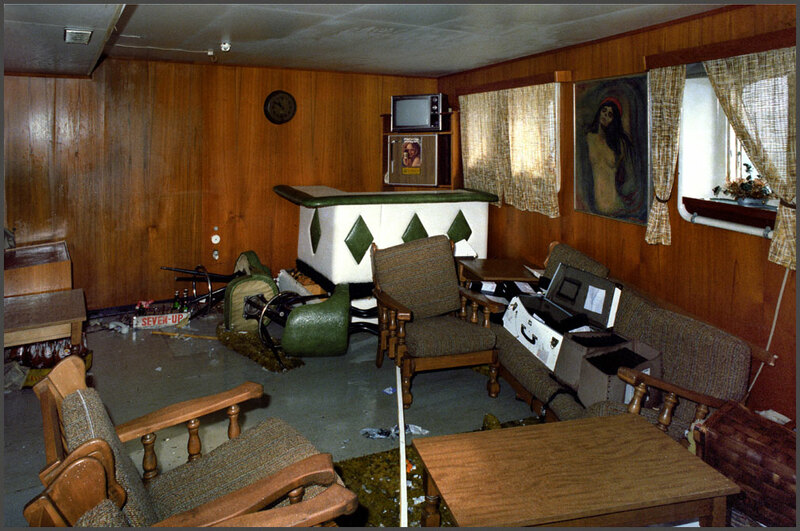 Another view of the Officer's Bar. 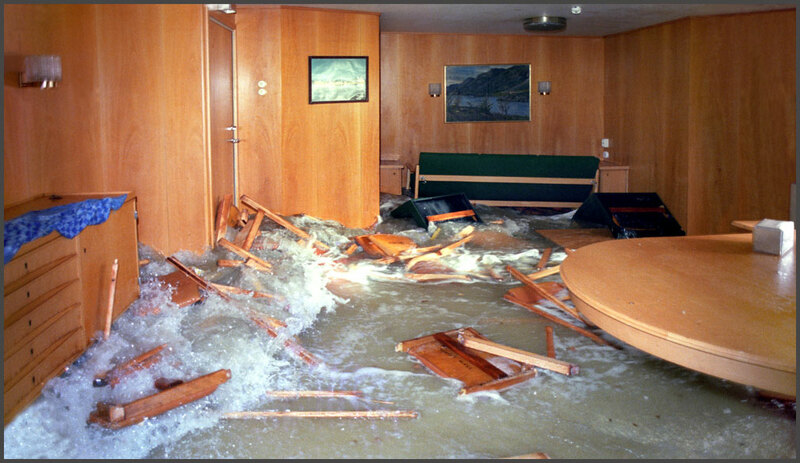 Chief Steward Erik Schønnemann tries to save the furniture in his cabin. 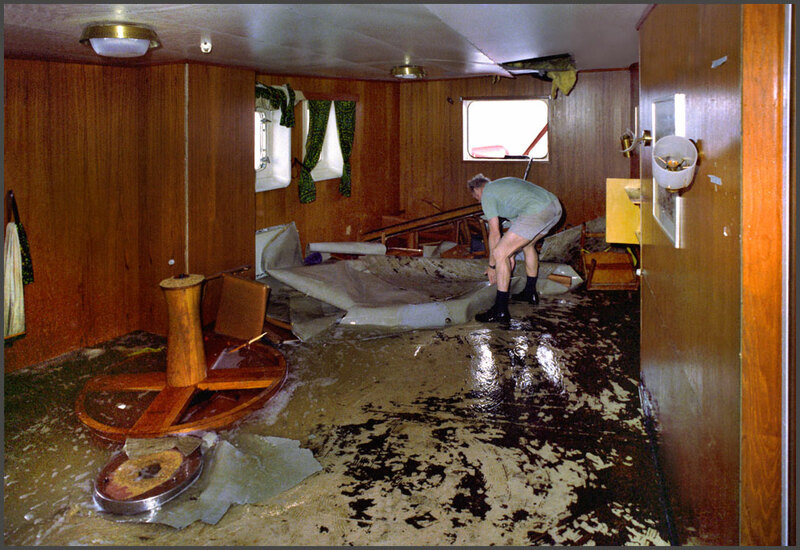 After the storm, - Captain Guttorm Oddenes inspecting the damage. 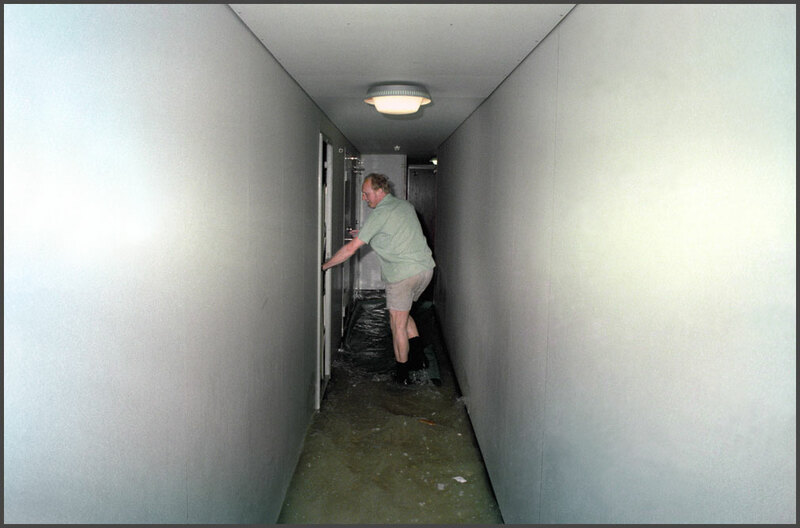 Take note of the damaged wall panels.